Malaysia is a multi-ethnic nation, and this status is reflected in the country's cuisine. As well as Malay dishes, you will also find Malaysian-Indian dishes (inspired by Indian cuisine), Malaysian-Chinese dishes (inspired by Chinese cuisine), as well as Mamak dishes (Malaysian-Indian Muslims), Nyonya dishes (invented by the Peranakan people of Malaysia and Singapore). Additionally, Malaysian cuisine includes dishes imported from Thai cuisine, and dishes created by the fusion of different culinary traditions (such Indian fried noodles, Malay fried noodles, and Chinese adaptations of Indian curry). Asam laksa - A soup containing white rice noodles, cucumber, fish, onion, and pineapple. It is flavored with basil and tamarind. Bak kut teh - A Chinese-Malaysian soup made by boiling pork ribs with garlic and herbs for several hours. Bakkwa - Chinese barbecued pork, especially popular during Chinese New Year. Curry mee - Vermicilli noodles with a spicy curry soup containing coconut, chicken, cuttlefish, and dried tofu. Hokkien mee - Crispy thick yellow noodles fried in soy sauce and pork lard. Ikan bakar - Fish or seafood marinated with spices or sambal (a spicy paste) cooked on a charcoal grill, sometimes on top of a banana leaf. Keropok lekor - A Malay dish from the East of the country. Keropok lekor is a savory cake made from batter and shredded fish, which fried and then eaten with hot sauce. Kuih - Small bite-sized dishes. They can be sweet or savory. Lontong - Small cakes of compressed rice. The dish is prepared by boiling partially cooked rice inside a banana leaf, and is eaten cold. Maggi goreng - Noodles (Maggi instant noodles) with vegetable curry, tofu and egg. Mamak rojak - Fried dough fritters with bean curds, bean sprouts, boiled potatoes, cucumber, hard-boiled eggs, and prawn fritters. It is eaten with a spicy peanut sauce, and is a popular street food. Nasi dagang - Rice soaked in coconut cream and then steamed. This dish is popular in eastern Malaysia, and is usually eaten with fish curry, hard-boiled eggs, pickled vegetables, and fried coconut shavings. Nasi goreng - Fried rice with vegetables such as shallot and spring onions, usually flavored with fried mackerel or anchovies. Nasi lemak - Rice soaked in coconut cream and then steamed. It is usually flavored with ginger and lemon grass, and then served with cucumber slices, dried anchovies (ikan bilis), a hard-boiled egg, pickled vegetables, roasted peanuts, and a hot spicy sauce. It may be accompanied by beef curry, chicken, cockle, or cuttlefish. Nasi paprik - This dish originates in Thai cuisine, but has become popular in Malaysia. 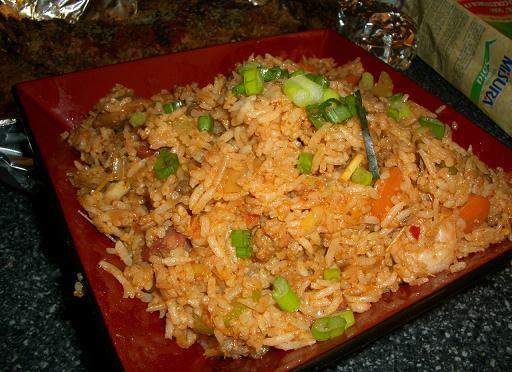 It consists of fried rice with a paprika sauce. Pao - Chinese steamed buns stuffed with meat. Thosai (or Dosai) - The Malaysian-Indian version of Indian cuisine's dosa: A thin pancake made from lentils, rice and water, browned on one side, then turned over and fried. It is eaten with vegetable curry (sambar) and chutney. Yong tau foo - Soup with eggplant, okra, fried tofu, and rice flour, flavored with chillies and fish paste. Zuk (or Zhou) - A rice porridge (congee) with chicken breast, fish slices, preserved eggs, salted eggs, and ground pork. It is often cooked together with sweet potatoes.